Could Allen Convention Center Be A Model? ALLEN, TX by Lisa Brown — This convention center is a new breed of walkable full-service property that blends corporate, leisure and resort aspects, and other cities around the country may have similar requirements and market demand. A four-star full-service Delta by Marriott Hotel with an attached convention center is set to open in late 2018. 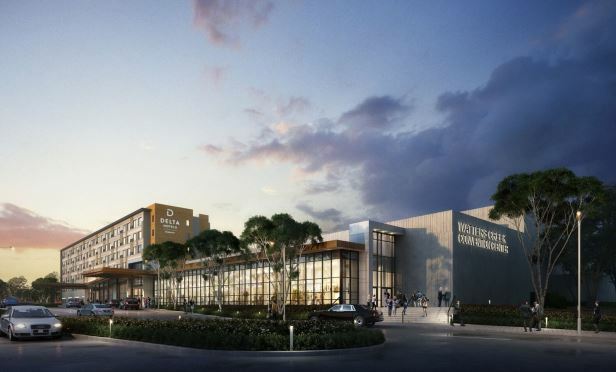 Visitors will have access to a variety of high-end shopping and dining options with the close proximity to mixed-use center Watters Creek at Montgomery Farm. The project will feature 300 guest rooms, 90,000 square feet of flexible convention, ballroom and meeting space, and 1,000 parking spaces, making it one of the largest facilities of its kind in North Texas, says Altera Development Company LLC, which has begun construction on the project. Delta by Marriott is Marriott’s newest full-service hotel brand. A restaurant and a destination bar located adjacent to an outdoor courtyard with a swimming pool are designed to allow guests to meet and entertain. The Delta focus on upscale essentials includes a 24-hour elite pantry, a fitness center, free WiFi and bottled water available on every floor. The city of Allen, Allen Economic Development Corporation and Allen Community Development Corporation are jointly investing in the project. Benchmark Hospitality has been chosen to operate and market the facility. The Allen Convention and Visitors Bureau, which brings a wide range of events, organizations and visitors to Allen, will relocate to the facility. “The new convention center and hotel will provide the city of Allen with the capability to host larger meetings, sporting events, trade shows and conferences, generating revenue and tax dollars that benefit our community,” said Karen Cromwell, director of the Allen Convention and Visitors Bureau. Located just north of Dallas off US Highway 75, Allen combines city amenities with small-town hospitality. Meeting planners will have access to conference services and climate that allows for year-round recreational opportunities, including the Golf Courses at Watters Creek, entertainment venues, outlet shopping and dining. Allen is located within 30 miles of Dallas Fort Worth International and Dallas Love Field, with McKinney National Airport eight miles to the north. Copyright © 2019 Altera Development. All rights reserved.